Karim Souda defeats Mike Schmidt on the points after a very high paced fight that apparently maintained its pace from start to finish. Sak Kaponglek defeats Elias Aharram on a reportedly very wide points victory. It was also noted that Kaoponlek was merciful to Aharram when he had him in some danger. 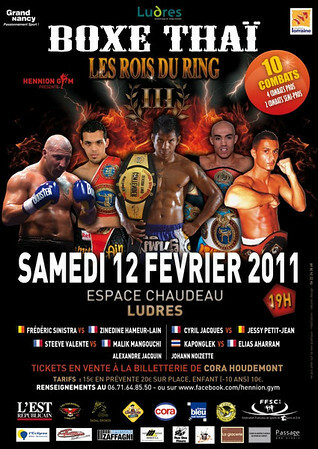 Lain-Zinedine Hameur defeats Sinistra Frederic by TKO stoppage. The referee called a halt to the action after a front kick from Hameur broke Sinistra’s nose in about 30 seconds into the first round. I will continue to update news of the results as I receive them. ~ by fatsoking on February 13, 2011.